When one thinks of wordless picture books, the names David Wiesner, and Shaun Tan, come to mind. Dig a bit deeper and there are all sorts of wordless wonders waiting to be read. 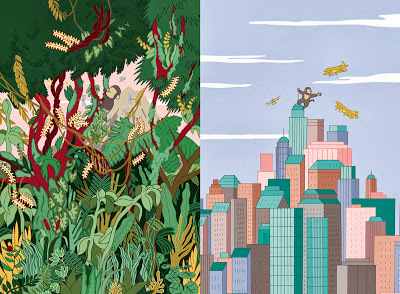 Before After by Anne-Margot Ramstein, and Matthias Aregui is an artful picture book that works on many levels. Ringing in at 176 pages, little readers can see how a little signet grows into a swan, learn that coffee beans become the coveted adult drink, and witness the view of a forest after a fire sweeps through. The beauty of a wordless book like this one, besides the obvious visual one, is that it invites readers to tell their own stories inspired by the illustrations. The images in this book all feature cause and effect, or as the title suggests, before and after examples. This would serve as a fabulous resource for writing prompts, for bedtime snuggles, and for curious minds who enjoy beautiful illustrations. On the funny side of the wordless spectrum, you can’t get more spunky than Welcome to Mamoko. Written and illustrated by Aleksandra Mizielinska and Anne-Margot Ramstein, the inside cover introduces 20 characters who are trying to get to the town carnival. Readers are encouraged to look through each of the following pages, once each from each character’s eyes. What follows are Where’s Waldo type pages of city scenes and cross sections of buildings in a well functioning community, with just a bit of outlandishness. For example, a UFO, elephants on roller skates and an art thief running off with Edward Munch’s The Scream. The book will feel large in small hands in the most delightful way. Young readers will learn to “read” a picture which is a strong early reading skill to acquire. Young readers can tell their own stories about the names of the buildings and the activities that are being shown. Each page can be revisited multiple times and new things will stand out. This would be a great book to take along on a trip or to be used with a study of community.